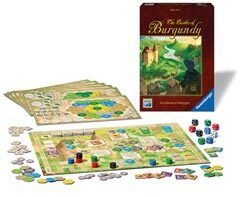 Ravensburger 81243 - 15th century princes from the Loire Valley devote their efforts to strategic trading and building in order to bring their estates to prosperity and prominence. Over the course of 5 rounds, collect the most points by trading, live stock farming, city building and scientific research to win! Contains: 1 Game Board, 6 Player Boards, Tiles: 56 Buildings, 28 Livestock, 26 Knowledge, 16 Castles, 12 Mines, 26 Ships, 42 Goods, 20 Silverlings, 30 Workers, 12 Bonus, 4 Victory, 8 Playing Pieces, 9 Dice, Instructions. Playing time 30 - 90 minutes. For 2 - 4 players.